The Purana is one of the two most important and popular Hindu texts, the other being the Ramayana. It is part of the popular tradition, rather than a literary classic like the Upanishads or the Gita. It tells the story of the god Krishna, the supreme godhead of the Hindus and worshipped by them for over two and a half millennia. The most popular stories about him occur in this, the 10th book, which is the climax of the epic. 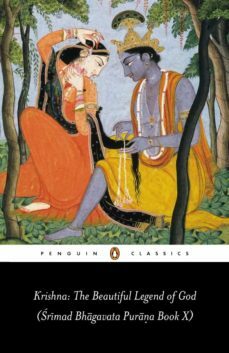 The stories relate to Krishnas childhood and adolescence in the forests of Vrindavan among the herdspeople, delightful tales which lie behind much of Hindu art, appearing in painting, temple sculpture, drama, dance and song.